Provide a single interface for each user to search your online resources! SRF Express Parallel Native Search minimizes the number of keystrokes and clicks your users must make to see your subscription database results! Most libraries show each subscription database as a separate icons or web-links divided into Database Categories. This display forces a user to click to select a Category just to see a list of available database names or icons. Then that user must click again to see a search screen before they may enter keywords. It may take four or five clicks before a user may enter keywords to search just one database! Normally a user wants to search another database with the same keywords to find additional resources. They have to find that icon and go to its search screen and then enter the same keywords again. Too many users just give up their search in frustration after four or five clicks. Our SRF Express Parallel-Native Search Virtual Tab eliminates all of those excess clicks. 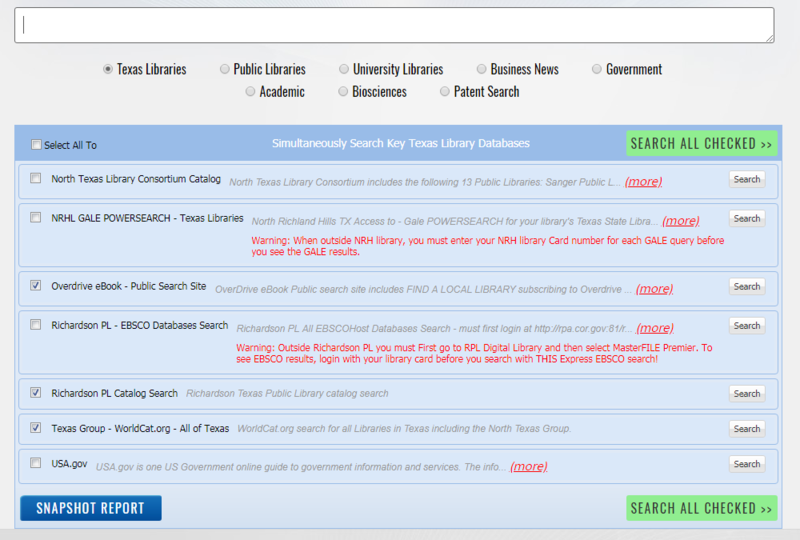 Our Express Parallel-Native Search presents a list of your library’s databases each with Search buttons. Each user may individually or simultaneously search several of your Library’s Top-Level, keyword-search databases, including your Catalog. Smaller and medium-size public and research libraries have not implemented a discovery service to perform this function because of the costs and complexities involved with such a “Library Discovery Service”. Search Real Fast offers a unique browser-based, Parallel Native solution for those libraries that offers the advantages of a discovery service with few of the disadvantages. This Unique, Simple, and Cost-Effective search solution offers each user a browser-based authenticated front-end parallel search tool for individual or simultaneous search of each Database. We give each user a single search screen to enter keywords. Then our Express Parallel search screen automatically displays the keywords and lists the Active Databases. With a single click, the user may simultaneously send queries to every Active Database directly from their browser. Each library selects the Active Databases your users may simultaneously query, including your existing library catalogue and Discovery service if you have one! Our Express Parallel Search is Easy to Use! Our Library Express Parallel Query Engine automatically builds a custom, complex, keyword query URL for each database and sends that URL directly to that database server. We currently offer custom URL database connectors to hundreds of publicly available search sites including over 100 US Government keyword search databases. We organize these database connectors into common subject areas called “Fields of Study”. One big advantage of our Express Parallel Query Engine is each user sees results for each database in a separate tab that displays the dynamic, faceted results screen that vendor has created for THEIR users. Each vendor’s results screen is tuned to quickly narrow or broaden their results to target each user’s needs. Each vendor’s Faceted Results screens displayed in separate tabs allows a user to easily identify the most useful databases for each of their search projects! Our Express Parallel search provides your Library with a Custom Search Form to put on your website. Our SRF Express Parallel Search service provides each subscribing library with an integrated ONLINE DATABASE SEARCH BOX customized for your Library, similar to the one you saw above. Search Real Fast preserves your library’s authentication processes and those of your subscription database vendors! Both the *EBSCOhost and *Gale PowerSearch (as well as ProQuest) databases in the “Active Project Search Sites” in the above screenshot are from your TSALC subscription databases. Each of these three search sites may need a specific configuration for your library building’s network, your authentication process, and your public IP addresses to display results from these and other subscription database vendors. When they click SUBMIT ALL QUERIES>>, this Express application screen automatically builds and sends queries, including your library’s unique authentication string, directly to EACH active search site database. Each database’s search results are then returned directly to the user’s browser and displayed in individual browser tabs. Our SRF web server does not need to interface with any of your library’s other electronic systems. We have our own server authentication processes that respect and preserve each library’s access restrictions, as well as those of your subscription database vendors. Our services uses your library’s IP addresses to recognize users in your buildings. When users connect to your network inside your buildings our Portal does not require any log-in unless your library requires this extra login authentication. Outside your library facilities, you also control the access authentication. If you want patrons to log-in outside your facilities, then they must register their username and password with our authentication service while they are inside your buildings or connected to one of your Library IP addresses. Outside your buildings and networks, you have two choices: Your user, while connected to your library’s network, must register with our authentication service using their email address and create a password. Alternately, your user may log into your library’s authentication service and then be redirected to your subscription databases. You choose the databases included in your library’s Custom EXPRESS PARALLEL SEARCH! Your library may choose any number from two to 10 databases from our Search Site Connector Library of hundreds of online search database. Our Search Real Fast staff configures, maintains and periodically reconfigures, each of your Express Parallel Search Boxes or Virtual Tabs for your selected databases. Our SRF Express Parallel Search is Easy to Try Out. We are confident that your best way to understand how our Library Express Parallel Search works is to try it out! So, we have created a number of Express Parallel Search Demo links for multiple subject areas. For more information contact Jim Hummel at jim@searchrealfast.com or call 469-215-5485.